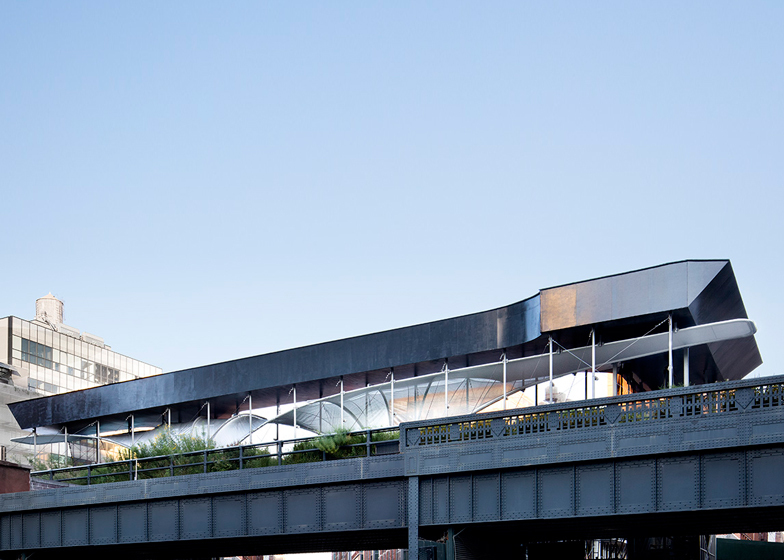 Zaha Hadid has created a swooping canopy for New York's High Line – in an area of the elevated park abutting the construction site for a building designed by the architect. Called Allongé, the installation is made of silver fabric stretched over a curvilinear metal frame. The fabric canopy is covered by a black wooden shed. Measuring 112 feet (34 metres) in length and 14.5 feet (4.4 metres) in height, the structure serves as a "pedestrian tunnel" in a stretch of the High Line that passes by the construction site for 520 West 28th Street – an 11-storey condo tower by Hadid that is slated to open in 2016. Developers constructing buildings next to the High Line are required to erect a protective shed to comply with safety regulations. "The swooping design of the temporary construction shelter embodies Zaha Hadid's organic design aesthetic while serving as a mandatory protective cover for the High Line, and foreshadows the fluid forms of her dramatic new sculptural building," said Related Companies, the developer of 520 West 28th Street. "The installation seizes the opportunity to beautify necessary infrastructure by offering a compelling experience while also protecting pedestrians." The design was inspired by the "connectivity and dynamism of movement" in the High Line, the popular Manhattan park that was formerly a derelict railway. The linear park's central pathway passes under the Hadid installation. The structure's curvy shape is meant to contrast the rigidity of the New York streetscape. "In doing so, it acts as an extrusion of the spatial ideas inherent in Hadid's architecture, where form follows not only function but is also drawn along by the narrative of movement through space," said the developer. The installation mimics the form of 520 West 28th Street, which is Hadid's first building in New York. The sculptural glass and steel residential building will feature 37 units, private courtyards and a communal garden. "I've always been fascinated by the High Line and its possibilities for the city," said Hadid in a statement. "Decades ago, I used to visit the galleries in the area and consider how to build along the route. It's very exciting to be building there now." The High Line has become an established venue for artwork. In June, the park unveiled an installation by artist Olafur Eliasson, in which architects such as Steven Holl and Bjarke Ingels created small structures made of LEGOs. The Friends of the High Line, which manages the park, hired its first art curator, Cecilia Alemani, in 2011.